This delightful mixture is a milder blend of spices is enjoyed in Indonesian and Malaysian cooking, for curries, sambals, casseroles, and kebabs. Sprinkle over sauted vegetables and add coconut milk to create a tasty and healthy vegetarian style curry dish. Mix with potatoes, onions, and a drop of coconut milk for wonderful Malaysian curry puffs. 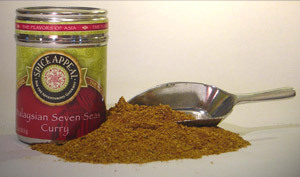 Contains cardamom, cassia, fennel, chili powder, cloves, coriander, and other spices.